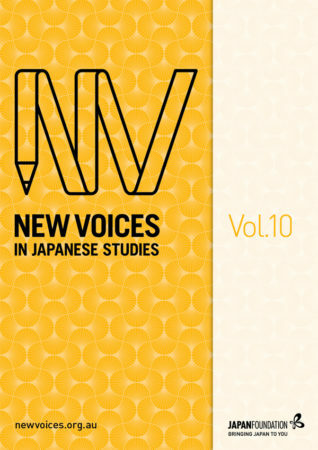 As the height of winter approaches again, it is my pleasure to introduce Volume 10 of New Voices in Japanese Studies. It is no small feat for NVJS to be releasing its tenth edition. The journal is a modestly staffed and resourced publication which owes its continuation to the involvement of established local Japanese Studies academics who support the journal’s mission of mentoring up-and-coming scholars. These academics have played a crucial role in the journal over its life to date, by encouraging postgraduate students to submit and refine their papers, by lending their expertise to peer review and—in the case of ten particularly dedicated individuals—by taking on the central role of guest editor. Importantly, NVJS also owes this milestone to the continuing enthusiasm, passion and discipline of local postgraduate scholars who choose to focus their research on Japan and then share that work within this journal. This anniversary volume features a small but robust selection of papers on a diverse range of themes by a mostly Honours-level cohort of authors. It is indeed encouraging to see such incisive and rigorous Japan-related research emerging at postgraduate level, and predominantly Honours level at that. With young researchers of this calibre on the horizon, it is with excitement that I look to the future of Japanese Studies locally. This volume would not have been possible without the dedicated guidance and assistance of Guest Editor Dr Penny Bailey from The University of Queensland. Despite a demanding teaching schedule among other important commitments, Dr Bailey gave incredibly generously of her time and expertise over multiple readings of these and other submissions to ensure the integrity of this volume. The role of Guest Editor is at times demanding; I am grateful to Dr Bailey for not just meeting but exceeding these demands—always with consummate grace, and always with a keen eye for balancing the sometimes conflicting needs of academic publishing. On behalf of the NVJS team, I thank you for helping this volume to become the very best it could possibly be. I would also like to extend my thanks to this year’s Editorial Board, who also gave generously of their time and expertise to help the authors develop their submissions. Their feedback has been incredibly valuable in shaping the papers in this volume—as has the feedback of the authors’ academic supervisors, who so kindly recommended their students submit to NVJS. As well, I wish to acknowledge the contributions of last year’s Guest Editor, Dr Olivier Krischer, and Acting Series Editor Leah Sourris to this volume, as some of the papers published here were initially submitted in a previous call for papers and have benefited from their feedback. Turning now to the current team, I wish to thank the NVJS Series Editor, Elicia O’Reilly, for her efforts not only in bringing this volume to fruition, but also in establishing two new partnerships this year: one with the EBSCOhost research database, and another with Ithenticate. The EBSCOhost partnership comes in addition to NVJS’s existing indexation in the Directory of Open Access Journals (DOAJ) and Ingenta databases, and will surely see the journal’s reach expand. Meanwhile, the Ithenticate partnership adds an increased layer of certainty to the publication process, further enhancing the journal’s credibility as a platform for original local research. My thanks also go to Supervising Manager Ayusa Koshi for supporting this project. Last but certainly not least, I wish to thank the authors who submitted their work for this volume of NVJS. As always, there are some authors whose work was not selected for this volume, but I hope that they found the editorial feedback they received to be valuable, and I join the editors in encouraging and welcoming these authors to revise and resubmit. To those authors whose research is published here, I congratulate you on your hard work, and I am glad to know that the result is a rigorous academic article of which you can be proud. I wish you all the very best for your future, and look forward to seeing further contributions from you in the scholarly sphere over the years to come.